Coll, the highest ranked Kiwi male since Ross Norman in 1993, claimed his biggest title to date after defeating Egypt’s Tarek Momen in the final of the Canary Wharf Squash Classic last month. As a result, the 26-year-old has risen two place to climb to No.5. This is coming after enjoying a stellar month which saw him reach the quarter-finals of the 2018-2019 PSA World Championships for the first time in his career and the quarter-finals of the Grasshopper Cup. ElShorbagy remaining at No.2 and Tarek Momen (No.3) also keeping his place to make it an all-Egyptian top three. Meanwhile, Germany’s Simon Rösner rises a place to No.4 to complete the top five. While Egypt’s Mohamed Abouelghar (No.8) and Peru’s Diego Elias are both non-movers as they take the other spots in the top 10. Egypt’s Marwan ElShorbagy drops a place to No.11, while compatriot Omar Mosaad rises one place to No.12. France’s former World Champion Gregory Gaultier drops down two places to No.13 in the world with the former World No.1 still recovering from a knee injury sustained at last year’s U.S. Open. Germany’s Raphael Kandra, Wales’ Joel Makin and England’s Declan James are all on the rise. Kandra moves up two places to reach a career-high of No.14, while Makin also claims his highest ranking to date, rising three places to No.15. James becomes the new England No.1 as he moves three places to reach No.17. In the women ranking, Nour El Sherbini’s title win at the 2018-2019 PSA World Championships in Chicago last month, has drawn her closer to current World No.1 Raneem El Welily to less than 200 points in the PSA Women’s World Rankings for April. 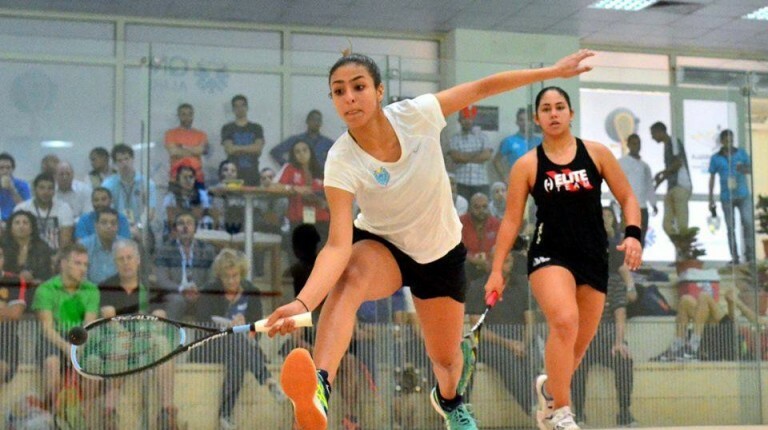 Where she defeated El Sherbini in the final while compatriot El Tayeb remains at No.3 to complete an all-Egyptian top three for the second consecutive month. Meanwhile, England’s Sarah-Jane Perry remains at No.6, Egypt’s Nouran Gohar (No.7) and England’s Laura Massaro (No.8) swap places. Welshwoman Tesni Evans rises back to a joint career-high of No.9, with England’s Alison Waters completing the top 10. United States’ No.1 Amanda Sobhy rises one place to No.12 following her win at the Texas Open yesterday, which saw the American claim her biggest PSA title to date. Egypt’s Salma Hany (No.14) and India’s Joshna Chinappa (No.15) all occupying the other spots in the top 15. Egypt’s Hania El Hammamy (No.16), Hong Kong’s Joey Chan (No.17), Egypt’s Yathreb Adel (No.18) and America’s Olivia Blatchford Clyne (No.20) completing the top 20.